July 4th in the UK is Independants' day. Most of the time you will hear me talk about Indie Polish but I like to support all small businesses when I can. 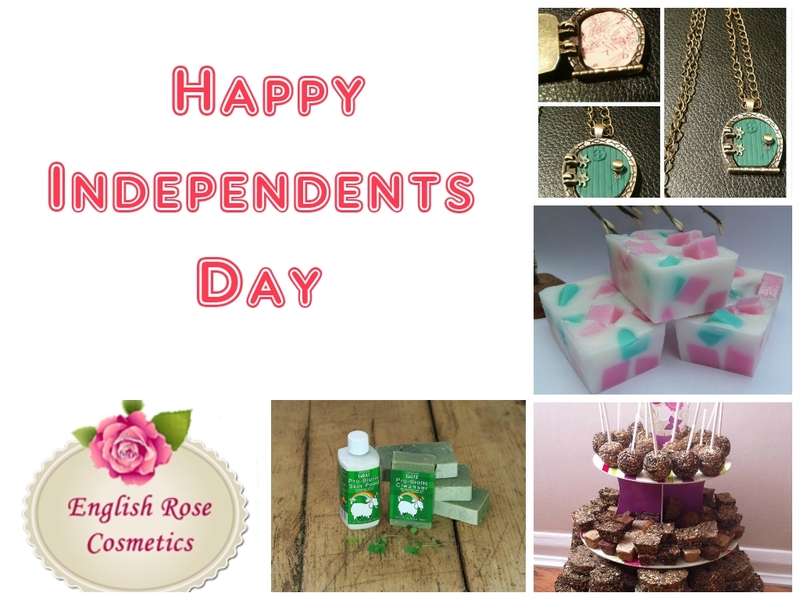 Independents' Day is a national campaign that promotes and celebrates independent businesses across the UK. You can support Independent businesses by buying locally, buying online from a small business (try places like ETSY where most things are handmade) or even just promoting a friends small venture. As a retired small business owner I know how every order counts, most of the time handmade products are better quality and more ethically made/sourced. In my opinion this can be worth the (sometimes) slightly higher prices. This is a super local brand to where I went to university. You might remember my rather horrific confession about the state of my skin about half a year back. The lady who owns English Rose Cosmetics contacted me about trialing her new Gentle Face Wash with Quillaja (now named Fair of Face). No word of a lie this stuff is magical, I highly recommend it. Fair of Face is soon to be on sale and I highly recommend checking out the rest of the products on offer too! The English Rose Cosmetics brand is now also stocked on Amazon! I am soon to do a full review on these products so I am not going to go into a huge amount of detail, but my skin has never felt so good. Using raw active goats milk to create pro-biotic skin care (among other things- including pet care products) it isn't something I would normally consider but if you have problem skin this could be your savior! This brand has an amazing story behind it too! Trust me you need to check 'em out! You can also buy Chuckling Goat's products at Fortnum & Mason! I have only discovered this brand tonight but they have jumped right to the top of my 'must-buy' list. Doesn't the photograph look good enough to eat? Would you be surprised when I said these were handmade all natural fresh treats for your pets? I can't wait to buy some for my Hamsters but they also do dog/cat/bird/ small animal treats too! You can message Angie via facebook for a quote to meet your needs! Again I am new to this brand but I have only hear amazing things about the HUGE range of scent combination and design of wax melts and candles. I can't wait to place an order, I already have a wishlist as long as my arm! These brightly coloured wax melts look like little works of art! If you love unique and alternative handmade jewellery then this is the shop for you. Run by the lovely Emma this shop is filled with oodles of amazing finds. I love the hobbit door necklace (pictured above) but there are so many other amazing things to be found. All the pieces are very reasonably priced and Emma regularly sells one off pieces and does flash sales! As well as this a new line of laser cut acrylic pieces are a real talking piece! Seriously go check them out now! I cannot recommend them more highly! I love supporting small businesses, if you are a small business let me know as I would love to promote you too! Great to know about these!